DR. LASZLO PUCZKÓ, XELLUM CONSULTING LTD. Important Note About Registration: Because of limited capacity please email Dr. Vequist (vequist@uiwtx.edu) in order to RSVP and guarantee your participation! April 26-27, 2013 – Heidelberg, Germany. 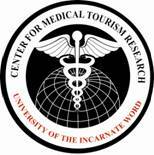 The CMTR examines business, clinical, economic, ethical, legal, marketing, operational, policy, social justice, and societal impacts of the Medical Tourism, Medical Travel, Dental Tourism, Health Tourism, Wellness Tourism, Fertility Tourism, Transplant Tourism, and Retirement Tourism industries worldwide. This symposium is open to all interested stakeholders in this emerging global industry. 3:00 PM Room - 1 - Joachim Willms, "Taming Turkey's Hottest Waters - Türkey's planned rise to the global top of thermal tourism", Professor, Tourism Sciences & International Affairs, DIPLOMA University of Applied Sciences, Germany Room - 2 - Jose Moreno, "Impact of household income level in the medical tourist expectations", Assistant Professor, H-E-B School of Business & Administration, UIW, U.S.A. The CMTR will be holding the 4th Annual Medical Tourism Research Conference in September, 2013 at Anaheim, California, U.S.A. (near the Disneyland resort).